​Sir William of the Leaf's tea focused writings. I have never really looked into ginseng oolong before because I had just lumped it into the category of flavored teas, which usually I don't purchase to drink. If someone buys a flavored tea for me I will enjoy it as such, but I never quite wanted this blog to feature flavored teas. I have been lacking in posts due to the limited number of samples I have been receiving, although that will change this month! I have gained quite a collection and wish to show them off to you all! This tea was interesting from the get go. The pearled leaves, oolong from DongDing mountain in Taiwan, are coated in what almost looks like a ginseng paste. They are a dull, hunter green color and carry the smell of ginseng, strawberry, hibiscus and greenery. The scents aren't all that strong and don't lead me right away to assume the tea was flavored with anything! The taste really was a delightful surprise! 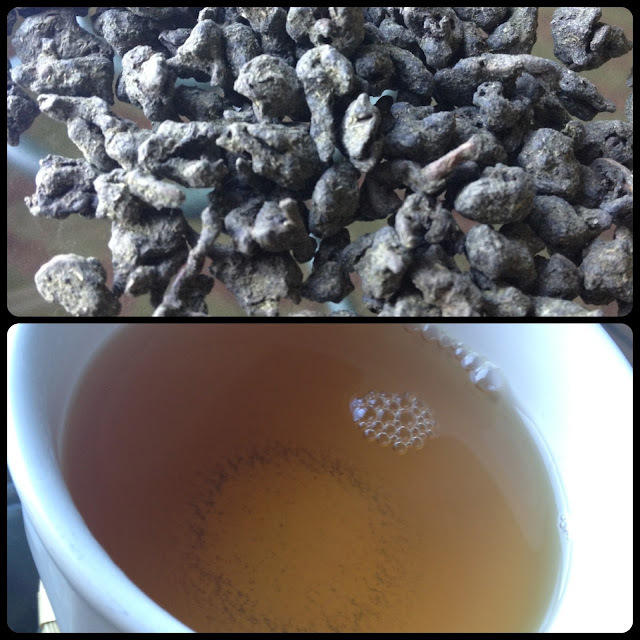 It is lightly flavorful and reminiscent of a roasted oolong with a layer of sweet fruit! It is balanced great and has a delicate mouthfeel. Brown sugar, peaches, toasted nuts and strawberry come to mind as I sip and savor this first encounter. It struck me afterwards that it reminded me of a sweet, flakey pie crust! I didn't know that the ginseng would be so subtle and yet add so much to a tea. This tea would be wonderful iced and really appeal to a wide audience! I couldn't drink this every day, but every now and again this tea is really a good treat! Thank you to Teavivre for the sample! Every time I open one of their teas I am really starting to enjoy the quality and wonderful customer service this company offers! Their prices are nothing to overlook either! Definitely recommend this company for some good teas and good deals! Written by Sir William of the Leaf On August 11, 2012 In "Oolong"
It has certainly been a while since I posted! I just got in a new shipment of tea and it inspired me to sit and relax with a good cup! This tricky little Darjeeling, at first glance, would have you thinking that it is an Assam! The golden tips are unusual for the champagne of teas to possess, although not unlikely for its brother and partner in crime, Assam teas! This tea shouted cocoa, malt, caramel and wheat, very boldly I may add! It got me thinking, why might it look so familiar to an Assam! Well google had the answer, of course. It looks as if the estate is nestled in between Bhutan and Nepal, and right beneath the Sikkim estate. If you have read up on your geography of southeast Asia, you would know that is shockingly close to Assam! So, that brings me some peace about the similarities! Now with that out of the way, the infused leaf, shown at the bottom right, has the aromas of bakers chocolate, berry, and the dominant aroma is malt, who's bold attitude never fails to rise above the more reserved scents. The liquor's aroma is more sweet in character, pronouncing caramel and a more tame malty presence. The flavor is surprisingly subtle... Little woody, little malty, hint of berry, but overall very mature, which could be because of the year's worth of rest that the tea received! Overall a wonderful tea! Very unlike prior autumnals I have tasted, but I don't ever mind a surprise! Written by Sir William of the Leaf On July 16, 2012 In "Black"
for providing me with numerous samples of one of my very favorite (if not my overall favorite) types of tea. For those of you who read this blog, or have read some of my early posts, you know what I am about to say. You know how I will talk up Autumnal Flush Darjeeling teas all day, every day, and to every person. You know how I will talk about their sweet, pumpkin/squash notes and their autumn inspired aromas and flavors. I could go on, but I think you understand my enduring love for Autumnal Flush Darjeelings. This one, well, threw me a little unexpected difference compared to some of the others in its fine group I have had the pleasure of drinking. The aroma of the dry leaf was strikingly different than what I had expected! I sensed caramel, raspberry and cocoa. The dominant scents were the berry tones which smelled bright, tart, and sweet all at the same time. I am always up for the unexpected. and I wrote "tangy grape and wheat." This is a very accurate description of the aroma of the beautiful liquor. The grape notes are associated with the all-too-common muscatel scent that Darjeeling teas tend to produce. The wheat, now, that I am not sure of the origins, but I am not at all upset! This was a new adventure I was willing to take. The first flavors distinguished were of bright berry and agave nectar. This tea is not complex, as most Autumnals have in common. A light, tart astringency tugged as the tea was swallowed, and left a wheat-y finish. It is a bit flat, but as I have stated, this is an attribute I expect from an Autumnal. The second infusion presents citrus (lemon) and mango notes with a very mild astringency. Even when brewed not in western fashion, the tea hesitates to become overly astringent. This is a fantastic characteristic for a sometimes unfocused brewer (myself...). Also, it really hits home that this is definitely, without a doubt, in fact, a true, honest, down-to-earth, Autumnal Flush Darjeeling (not that I assumed it wasn't, as I trust the vendor). All in all, pretty splendid tea, although, it will need a few more brews to grow on me I think. It is just very unlike others I have had, not bad! I can tell it is superb quality tea. Also, it had said on the package that this tea's grade is "Red Thunder." Anyone (vendor perhaps?) care to explain? I am used to the string of letters (SFTGFOP) as a grading scale, not native american names. I have more samples of Autumn Flush teas I am dying to open up. Written by Sir William of the Leaf On April 17, 2012 In "Black"